The other numbered lines should look rather familiar — the private Market St Railway Company (which ran the numbered lines) was acquired in 1944 by the city-owned Muni (which ran the lettered lines). But in the late 40s and early 50s, the city ripped out the streetcars and their rails and replaced them with futuristic buses (except for the J, K, L, M and N). The 11 line didn’t make it, and our 1958 photo shows us the newly planted palm trees in its place. As for the other streetcar lines in the Mission, our beloved 26 ran down Guerrero instead of Valencia (until 18th where it switched over to Mission). In this 1928 photo from the SF Public Library, we see the 26 (and 10) tracks running down (a not-yet-widened) Guerrero and 28th with San Jose Ave breaking off to the right (site of the soon-to-be Pavement-to-Parks plaza). There was a 9 line that ran down 29th to Mission and then continued on Valencia to the ferries. We’ve previously seen this 1948 shot of the 9 in front of the old Lyceum Theatre (aka Safeway). The location of the 9 line photo below is not labeled on the SFPL site, but I am fairly certain this is looking north on Valencia, right after it merges with Mission. If so, that’s Duncan and St. Luke’s on the left. 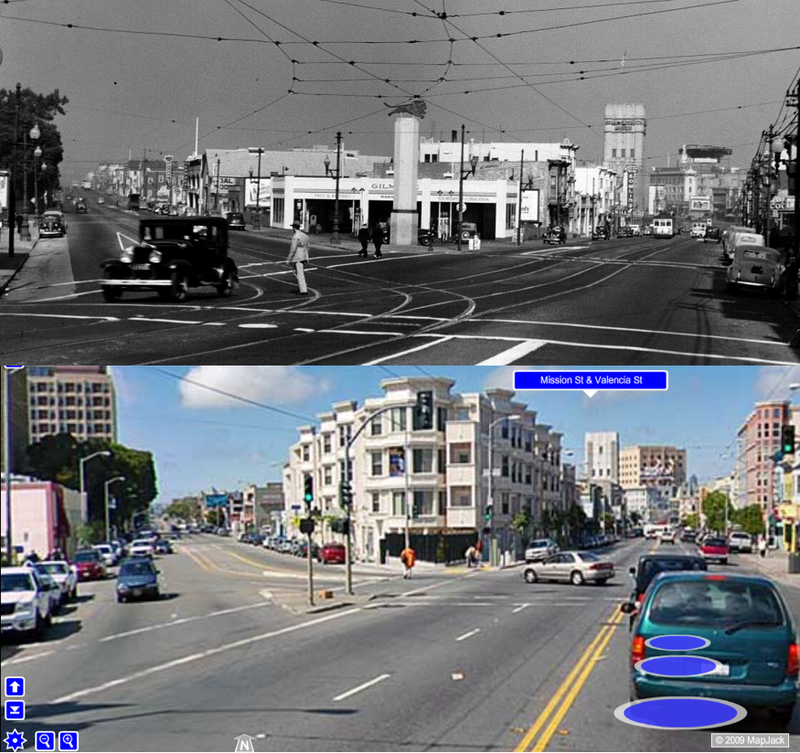 Here is the intersection of Valencia and Mission in 1945 — the shot above would be to the left. The tower on the right is the Sears building. Lots more 9 and 36 streetcar pictures on the Bernal History Project website. Great post, fantastic photos! Thanks! Thanks for the props; I can’t wait until the bowling, seriously. I moved here too late for the 11-Hoffman; the 13-Guerrero was axed in 1988, about a year after I arrived. Le sigh. amazing the history of this place, especially all the bus/trolley lines that are no more. I guess the 26 will be joining them soon in the annals of history? If you’re able to bring this somehow back to bowling, in three posts, I’ll be impressed! Yeah, 50 years from now some dude will be posting pictures of the 26 on the IntarSpaceWeb and people will be getting all excited. Johnny, you’re right! I guess there’s nothing like a train nerd, huh? This is terrific, not sure how I missed this post before. Do you know anything about the Valencia St. Cable Car line? Yup – some more on the old 26 Valencia streetcar here and here. That two block stretch of Dolores without the raised grass median strip between 22nd and 24th Streets was because a street car ran there. It ran west on 22nd to Dolores, then south to 24th and west on 24th through Noe Valley. The 11 line westbound ran on 22nd St, then south on Chattanooga (not Dolores) between Dolores and Church) to 24th. It returned eastbound on Dolores.